Your strings matter. 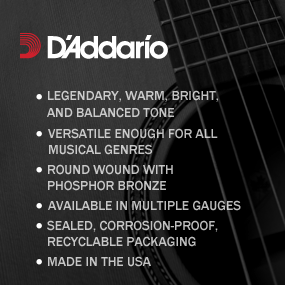 D'Addario's Phosphor Bronze acoustic guitar strings are engineered to serve as the critical link between you and your guitar. Our most popular acoustic guitar strings, EJ's are precision wound with corrosion resistant Phosphor Bronze onto a carefully drawn, hexagonally shaped, high carbon steel core. The result is long lasting, bright sounding tone with excellent intonation. Three components of a D'Addario guitar string work together to create your desired tone: Hex-core, outer wrap wire, and ball-end. It all starts with the core. D'Addario pioneered the use of the Hex Core, and as the name suggests, it is a six-sided high carbon steel core-wire. Each side "bites" into the wire used for the outer winding, creating a tight and consistent bond that keeps the string in tune from end to end. The final component is a D'Addario exclusive: color-coded ball-ends that secure the string in place at the guitar's bridge, allowing for easy string identification and a major reduction in wasteful packaging. 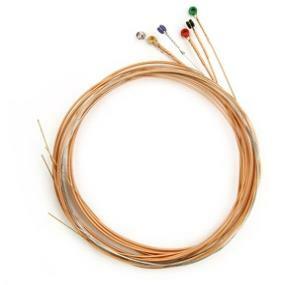 92% copper and 8% tin with phosphorous, introduced to string making by D'Addario in 1974 as the first "extended life" strings. Phosphor Bronze is synonymous with warm, bright, and well balanced acoustic tone. Ideal for the widest variety of guitars and musical styles, D'Addario acoustic strings are the choice of countless professionals around the world including Dave Matthews, Sheryl Crow, Keith Urban, Blake Shelton, Ryan Adams, and many more! It all starts with our exclusively engineered and built string winding machines. There is literally nothing like a D'Addario string machine. The combination of the most advanced computer-controlled winding technology and stringent incoming wire inspection delivers unmatched consistency, string after string, set after set. Our passion for and commitment to environmentally responsible packaging and raw materials fuels our continued innovation. Last but not least, every D'Addario string is made in the USA, ensuring the highest quality and performance.